Our hazelnut cream is made from a selection of the very best hazelnuts (20%), sugar and glucose syrup. There are no additives because we believe that natural ingredients are the best: we simply mix the ingredients in the perfect amounts. . Our strong commitment to quality is backed by an automated process with multiple quality controls. Hazelnuts grow naturally in mountain areas and are cultivated in many parts of Spain, but hazelnut farming is most extensive in the area called Camp de Tarragona, and the town Reus, the home of Almendrina, is considered the hazelnut capital of Spain. Situated in the heart of the traditional hazelnut farming area and thanks to the wisdom and experience gained over many years, we always work with hazelnuts of exceptionally high quality. Hazelnuts are an enriching part of the Mediterranean diet. They provide monounsaturated fatty acids like omega 3 and omega 6, which help to regulate cholesterol; magnesium, which keeps teeth and bones strong and healthy and reduces anxiety and insomnia; potassium, which regulates blood pressure and protects the cardiovascular system; phosphorus, which provides physical and mental energy and improves memory; vitamin E, a natural antioxidant; vitamins B6 and B9, calcium, iron, zinc, and more. 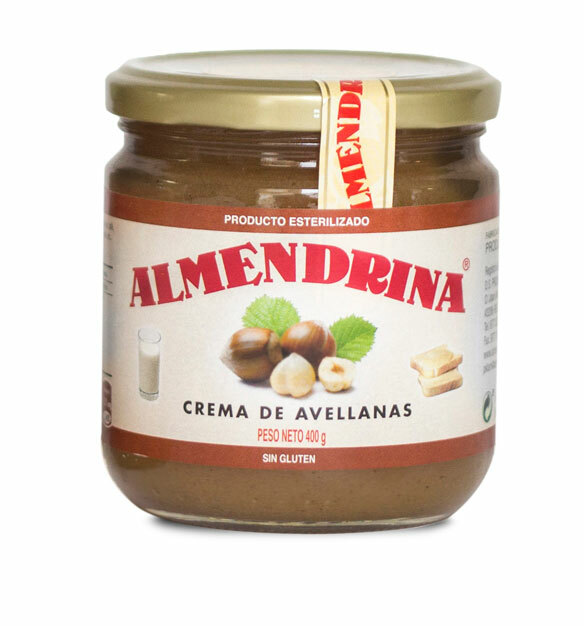 Its creamy texture comes from the oil contained in the hazelnuts. It is especially recommended for athletes, pregnant women, growing children and people with cardiovascular problems. Allergy information: may contain traces of other nuts. Hazelnuts (20%), sugar and glucose syrup. Gluten free. Choloesterol free. No artificial colours or preservatives. Palm oil free.